New Energy Department policies blocked nuclear power plans three years in the making. 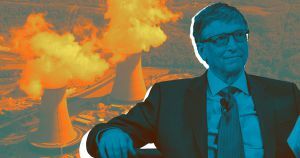 For the last three years, Bill Gates’ nuclear energy company has been working on a pilot project to develop safer and cheaper nuclear power near Beijing. But those plans recently came to a screeching halt — thanks to new regulations from the Department of Energy that restrict nuclear partnerships between America and China, according to The Wall Street Journal. In addition to back-and-forth tariffs on Chinese and American goods, the new restrictions require that any deal on nuclear technology between the two countries comes with strong assurances that it cannot be used for military purposes. Apparently Gates’ company, TerraPower, couldn’t make that promise, forcing it to look for a new partner nation to develop its experimental nuclear reactor. Unfortunately, the pickings are slim — and the derailed deal shows how international tensions can hurt efforts to develop next-generation technology. TerraPower is trying to build something called a Traveling-Wave Reactor, which would be capable of generating, using, and regenerating its own fuel out of depleted uranium. While this process would give rise to an era of cheaper, cleaner, and less risky nuclear power, the reactor itself would cost about $1 billion to build, the WSJ reports. That’s more than many of the countries with which TerraPower is legally allowed to partner, such as Turkey and the United Arab Emirates, could be willing to invest. In a blog post wrapping up 2018, Gates wrote that he would consider bringing all of TerraPowers’ operations to the U.S. but that there are too many regulatory hurdles for him to do so at the moment.